This is the 3rd discussion of our read-along. I'm loving this re-read! And I love discussing it with other readers! 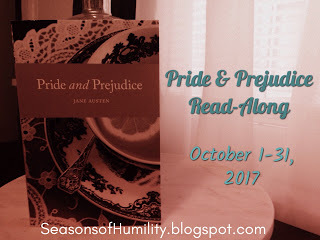 Go to Amber's blog at Seasons of Humility and check out her thoughts on P&P this week! "I am not a romantic, you know; I never was. I ask only a comfortable home; and considering Mr. Collin's character, connection, and situation in life, I am convinced that my chance of happiness with him is as fair as most people can boast on entering the marriage state." "Mr. Bennet's emotions were much more tranquil on the occasion, and such as he did experience he pronounced to be of a most agreeable sort; for it gratified him, he said, to discover that Charlotte Lucas, whom he had been used to think tolerably sensible, was as foolish as his wife, and more foolish than his daughter!" Bingley and company leaving Netherfield rather quickly was so sad for Jane. I do have to admire her for trying to be positive about people and give them an excuse for their behavior, but I think she carries it a bit too far in her persistence in believing that the sisters are such dear friends of hers. Especially when Lizzie sees right through them! "So, Lizzy, said he one day, your sister is crossed in love, I find. I congratulate her. Next to being married, a girl likes to be crossed a little in love now and then." "True, said Mr. Bennet, but it is a comfort to think that whatever of that kind may befall you, you have an affectionate mother who will make the most of it." Lizzy does seem to give Mr. Wickham a bit more slack than she does Charlotte or Mr. Darcy and it kind of frustrates me that she has such a double standard. It makes me believe Mr. Bennet in his thinking that all of his daughter's are foolish. "They are young in the ways of the world(speaking of Kitty and Lydia being despondent of Mr. Wickham turning his affection to someone else), and not yet open to the mortifying conviction that handsome young men must have something to live on as well as the plain." "Of music! Then pray speak aloud. It is of all subjects my delight. I must have my share in the conversation if you are speaking of music. There are few people in England, I suppose, who have more true enjoyment of music than myself, or a better natural taste. If I had ever learnt,I should have been a great proficient. And so would Anne, if her health had allowed her to apply. I am confident that she would have performed delightfully." Oh brother! See why the eye roll? And poor Mr. Darcy! So in love with Lizzy, yet so proud and so awkward in his asking for her hand in marriage. He really does think himself superior, but I also think he is awkward in social settings or even one on one. Plus I think that he doesn't know how to handle his emotions for Lizzy and even though he admires Lizzy's boldness in speech he doesn't quite know what to do with it! ha! Poor man has been thrown for a loop and gets the surprise of his life when she refuses him so vehemently. "In vain I have struggle. It will not do. My feelings will not be repressed. You must allow me to tell you how ardently I admire and love you." "You are mistaken, Mr. Darcy, if you supposed that the mode of your declaration affected me in any other way, than as it spared the concern which I might have felt in refusing you, had you behaved in a more gentlemanlike manner." That one haunts him for a long time!!! One of the questions Amber asked on her post was, "How would you respond to Mr. Darcy's proposal in this section?" I probably would have snorted at him and laughed! ha! Oh to possess Elizabeth's ability to take a person down a peg or two with such dignity! Go Lizzy!!! There are my thoughts for this week. Hope you enjoy and I hope you are enjoying the read-along. Since I am re-reading this for the umpteenth time I can safely say that it is STILL my favorite Austen read! Happy week y'all and feel free to leave your comments and links to your posts if you are reading along or if you have read P&P before. "Double standard" is an excellent way to describe Lizzy's differing views on Wickham vs. everyone else. So fun to finally be reading this book together! Thanks again for stopping by Amber! This was put in my "awaiting moderation" but then it never notified me that it was there. Sorry! Don't know why it does that. Anyway, I do enjoy discussing P&P with you! I hope you enjoy the outcome!!! Awesome, post Julie! I agree; it's frustrating that Lizzy is so willing the believe the best of Whickham, but not of others. And Mr. Darcy really is quite awkward, and that makes his pride all the more visible. Love the quotes you chose! Mr. Bennet is just full of wisdom! :-) Again, great post, Julie!